Our non-swimmer manatee tour on King's Bay. 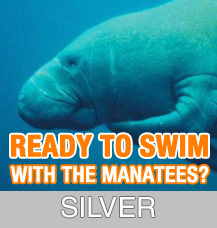 Swim with manatees in the Crystal River, the highest concentration of manatees worldwide. 7am & 10am. Introducing our new Mini-Private Tours. 3 hour tours. 7 AM and 10 AM, and possibly 1 PM depending upon demand. $79 per person with a minimum of 4 persons up to a maximum of 6.